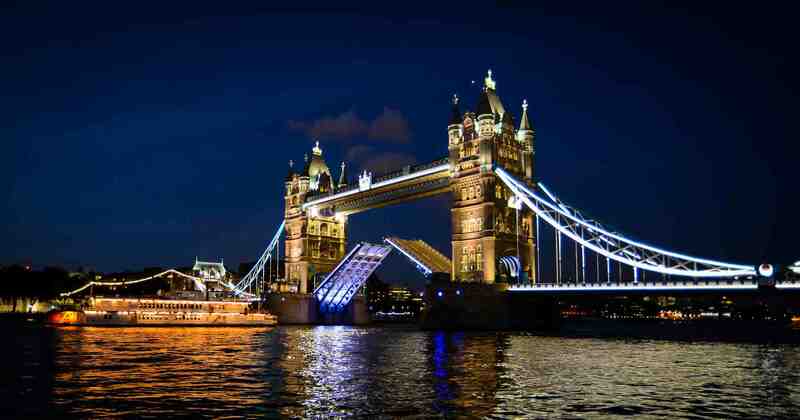 There are few monuments in the world as iconic as Tower Bridge. Famed as both a tourist attraction as well as an important and busy crossing of the Thames, Tower Bridge was officially opened in 1894 and is crossed by over 40,000 pedestrians and motorists every day. Consisting of two towers, connected at the upper level by two horizontal walkways, the central span of 200 feet between the towers is split into two equal bascules, or leaves, which are raised around 1000 times every year to allow river traffic to pass. The inside of Tower Bridge plays host to the Tower Bridge Exhibition, a display area where visitors can observe the Victorian engine room as well as learn about the history of the bridge via photos, films, and interactive displays. Tower Bridge is owned and maintained by the Bridge House Estates, a charitable trust overseen by the City of London Corporation. Bridge House Estates dates back to 1097 when medieval monks founded a charity that charged Londoners a toll for crossing London Bridge. The primary purpose of this trust was, and still is, to maintain all five city bridges – the London, Tower, Southwark, Blackfriars and Millennium bridges – at no cost to the taxpayer. The City of London Corporation put the supply and installation of its fire detection and alarm system out to tender in 2013. The renewal of the system had already been identified as part of the Corporation’s 20-year planned maintenance programme, with funding secured for the works. At the time of its replacement, the old fire alarm system was in very poor condition with both panels and devices discontinued. This meant that obtaining spares for the system was an increasing problem, with many of the devices in need of replacement. In addition, much of the field wiring had become damaged, most likely as a result of moisture ingress, and was causing faults on the system which was incurring expensive remedial works. As a result of the problems experienced with obtaining spares for its old closed protocol fire alarm system, the City of London Corporation’s preferred option for the replacement was an open protocol system. This allows the easy supply of spare parts as well as competitive future tendering as maintenance can be carried out by different fire alarm companies as required in the future. As a local authority, achieving value for money and high quality standards was crucial. As such, the City of London Corporation tender process was carried out in accordance with the COL Corporations procurement Regulations and Standing Orders. In total, five fire alarm specialists were invited to tender, all of which were required to have LPS 1014/BAFE accreditation. The new system had been subject to a preliminary design by a consultant acting for the City of London Corporation who had spent time on site studying the existing structures and planning the location of equipment around the premises.Following its successful bid and subsequent instruction to proceed, Firetecnics Systems Limited spent a week on site revisiting the different zones, and identifying a number of areas where the drawings were in need of adjustment or where access by the consultant had not been possible. These revised plans included a rework of the evacuation strategy, and led to the inclusion of voice alarms in the public areas of the building with the more traditional electronic sounders in the non-public spaces. Firetecnics also provided guidance on the significant planned works in the future at Tower Bridge as these works impacted on the way the system will be used, leading to a number of further design changes and amendments. The finished design comprised of an Apollo Fire Detectors fire detection and alarm system, incorporating five Kentec open protocol panels, two graphics panels and three voice racks. The Apollo field detection equipment used encompassed 100 Manual Call Points, 350 Discovery units, 50 XPander units and 12 Beam Detectors. These detectors were supported by 120 visual indicators, 50 interfaces and 200 DNH speakers. “In order to facilitate this, we reconfigured the network so that the security area is provided with a repeater panel, which can be relocated without actually having to break into the network, allowing simpler construction in the future. With the installation at Tower Bridge now complete, Bill Jordan explains the difference the new system has made: “Quite simply, the replaced system is simpler to manage and control. We have installed a graphics package which makes identifying locations much easier – devices can be monitored from the Bridge Engineer’s building, allowing more effective maintenance. Giving his seal of approval to the completed installation, Bob Course, concludes: “The new system is operating well – the two touch screen graphics interface allow the user and the brigade to see more easily where a fire activation has occurred. This can also be used for isolations and makes it very clear to see where these have been made as well as generally monitoring the day-to-day status of the system. The voice alarm in the public areas is a great improvement and allows the safe management and phased evacuation of people in the event of activation. Alarm Supply Pte Ltd is the official distributor of Apollo products in Asia. Please contact us for product brochure and additional information.